There is an increasing trend in regulation to require funds establish compliance with all relevant restrictions in the event of executing a new position. This is generally known as pre-trade monitoring. RiskSystem has developed a comprehensive pre-trade monitoring capability to allow fund managers to determine before executing a new position, if that position will cause the fund to exceed specified limits. Pre-trade monitoring requires a number of components be in place in order that it may be carried out in a rigorous manner. Firstly, the current portfolio in the system must be an accurate reflection of the actual portfolio of the fund. Secondly all current fund restrictions must be entered into the system. Thirdly, the manager must have the ability to alter positions without altering the integrity of the fund monitoring process. The significant difference between the pre-trade monitoring process and the standard risk monitoring process is that it requires the establishment and maintenance of a separate pre-trade user-id and this also requires some interaction between the fund manager and the data and risk analysts at RiskSystem. There are two types of pre-trade monitoring that are available using RiskSystem. The first is manager led where the fund manager is responsible for entering a pre-trade and for ensuring that the portfolio is compliant in the presence of that pre-trade. The second is compliance led where the fund manager is responsible for entering the pre-trade, but a separate compliance function is responsible for ensuring that the pre-trade is compliant with all relevant restrictions. 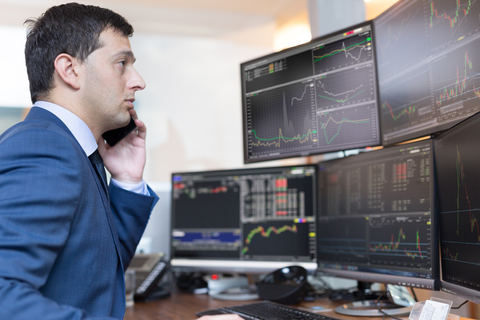 In a pre-trade monitoring process, the manager is given the ability to alter positions in the database. For this reason a separate user-id is established, specifically for pre-trading. All pre-trade activity is properly archived for future reporting, if required for a regulatory examination or an internal audit, for example. There is a specific screen that allows the user to edit existing positions. Under a compliance led process, once a pre-trade has been entered, the relevant compliance officers are notified. It is their responsibility to confirm the pre-trade. 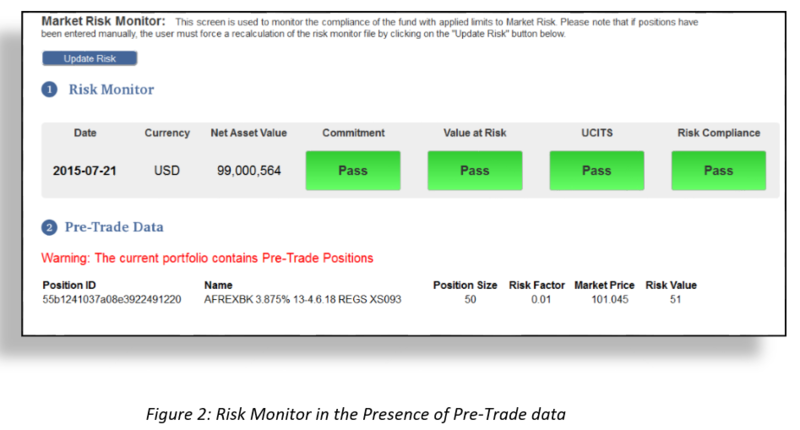 Until that confirmation is received, the pre-trade user-id monitor screen will show “N/A” compliance status, figure 3. In the compliance user-id, the Monitor screen has been adapted so that it can determine the compliance, or otherwise of the pre-trade(s), figure 4.